Ian.S.C. Parker(born Feb.11, 1936) joined the Kenya Game Department in 1956. He said that "very early in his career he broke ranks and advocated allowing Africans to hunt rather than treating them as poachers." This approach led to the creation of the Galana Game Management Scheme, perhaps the earliest and largest community conversation project in Africa. It eventually failed as documented by materials in the Parker collection. After 8 years as a game warden Ian Parker resigned to create Wildlife Services, Ltd. (WLS), the first wildlife research and management consultancy in East Africa. This company involved a great deal of contact with East African government conservation departments. While WLS was involved in may aspects of wildlife, it gained prominence by undertaking large scale elephant culling in Uganda, Kenya and Tanzania. This was the first time such work was attempted and resulted in a substantial output recorded in the scientific literature (and over 3,000 data sheets as described below). 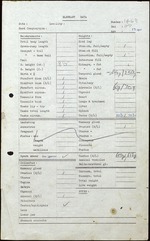 Related records in the Parker collection concern wildlife, land issues, and government corruption (e.g. how Kenya Conservation authorities became totally corrupt, particularly where ivory was concerned.) These records include several hundred photographs of documents, permits issued, pages of official government ivory registers, etc. These data are prima facie material documenting exactly what was going on for conservationists, they are also a study of how thins went wrong of substantial interest to other disciplines. Colle. gad Bulbo-urethral gl. .
! f ir 71 . Age s I ,^A . Crown-rump length Stomch,. full pty . ..,15 -l?' 1J tr ..' '"'_ "" "
*I-_ ~ / >R T "
PAnoestrus Ovaries (R/L) IJt /2ia. Speft smear 'Testes (R/L) . Anoestrus __Ovaries (R/L) 6p/ 7i) . Adrenal (R/L) / ~ ^ "
; ... .. ... .
- ~ T~r --~ . _-ftoo rr t,.v. s&&J. -. ^ F .. /- (' j. C n .. I'-- -* ~ ~ --- fe j. ---- -* l r'' P '* .7," -co;; . AWL k4 4 sr 4 ClA . - ------- ...~.. i:. '~. - ----"- -~ ,~--i~e -. ;,;. .,~~;... ......... -. - ..i: `.. ..... I 1 .